Hey…winning the NIT in New York would be really cool for these kids and the University. Let’s support them. Go Dawgs! They are the Pac-12 regular season champs. Bad conference or not, over the course of the season, they won it outright. Cal didn’t make it to the championship game of the tourney, either. Everyone said they were a lock, but an embarrassing loss to Colorado may have changed that. Arizona, who lost in the championship game, was beaten twice by Washington head to head. If that doesn’t mean anything when looking at tie-breakers, then something is wrong. Nobody else has a claim. I actually think you will see both Washington and Cal sneak in. They may both have to play on the first weekend (or play in games). Who cares, though? It’s about getting in. That being said, there is cause to be a little nervous until your name pops up today. Stay tuned! The Huskies class looks pretty good. Now. The real test will come over the next 2-3 years. It’s funny to look back over the recruiting classes and see how guys actually turned out to be stars. Of course, it’s all across the board. I’m pleased with how my home team and alma mater did. Landing Shaq Thompson, Jeff Lindquist and a few of the other guys whose names I can’t quite remember now sets them up for a bright future. In the end, however, it will all come down to execution on the field. That comes from coaching, talent, and a bit of serendipity. The crazy thing is how many kids flipped back and forth in just the past few days. Maybe reform is needed for the process, but I don’t see it happening. As Steve Sarkisian said today at his press conference, it boils down to finishing strong. 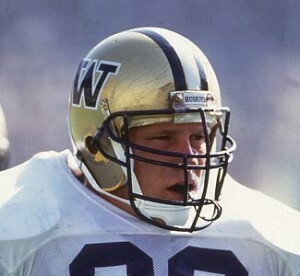 Let’s hope that the Dawgs finished strong with the right guys! Sure, the Dawgs were spurned by a couple of former players kids when Josh Garnett (Scott Garnett’s son) and Zack Banner (Lincoln Kennedy’s son) chose Stanford and USC respectively over their pop’s alma mater. Yes, it hurts but let’s be real. Maybe these guys wanted to make a mark in a school different than where their fathers played. I get that. Steve Sarkisian landed an even bigger fish. Shaq Thompson is the #1 rated safety in the country and one the top 5 players nationally. Certainly, all these kids still need to perform, but this was a coup for the Huskies. They also picked up a few more kids from California this evening and their class is rounding into fine shape. You never know what you’re getting. Sometimes kids don’t pan out. But, on a week that sets the stage for years to come, the Dawgs should be pleased even if they didn’t land Garnett and Banner. The best of the bunch may be heading to Montlake! and sophomores, and even a scholarship football player. The Dawgs have at times looked clumsy and out of sorts. They’ve lost games they should have won. And, through all of that, they find themselves atop the Pac-12 (with a whole lot of other teams) at 6-2, and 13-7 overall after a win against Arizona State last night in Tempe. At some point, we need to recognize the job Lorenzo Romar has done with this program. It’s one thing to recruit great players, which he has done. But, it is an altogether different thing to take a group of young players and guide them through turbulent times and growing pains, while still winning. That is exactly what he has done. Marv Harshman (Coach Romar’s old coach) at this point is certainly the king of coaches at Washington, at least in the modern era. 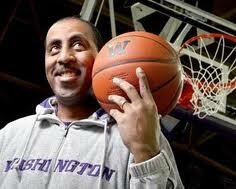 I see Lorenzo Romar surpassing his mentor at some point. Why? He’s much younger when he got started here; has a long term deal at his alma mater; is a terrific recruiter; and most of all lives by his convictions. And, as it seems, he may know a little bit about X’s and O’s. The Washington Huskies thrilling victory over the Arizona Wildcats was one for the ages. The defending of their Pac-10 tournament championship sent the Dawgs back into the NCAA Big Dance as a #7 seed against Georgia. Who knows what that seed would have been if they had lost? 2. The two freshmen – C.J. Wilcox and Terrance Ross – came up huge in the tournament and down the stretch in this game. They each hit 3-pointers like veterans to get the Dawgs into OT. The future is bright for this program. 3. Lorenzo Romar is a gamer coach. In other words, he makes all the right moves at the key times for this team. That comes in very handy come tournament time. 4. This team can get by Georgia, but the disappointing play down the stretch puts them in a situation that if they do advance, they will have to beat North Carolina, the #2 seed, to get back to the Sweet 16. Hey, but this is March Madness, right? Steve Sarkisian showed yesterday why college football is different than pro football. In a similar situation, with 4th and 1 for the season, 2 seconds left in the game, and down by 3 points, the pro coach kicks the tying field goal to go into overtime. There’s little flexibility with jobs in the NFL. In college, it’s different. Sark rolled the dice, trusted in his offensive line, QB, and RB, and won what might turn into a landmark game for the revitalized Washington Huskies. The Husky win means next week’s Apple Cup game against WSU means more than just state prode. It means a chance to go back to a bowl game for the first time in 8 years. This proud program is starving for it. My favorite part of “The Call” was Sarkisian rallying the troops on the sideline together. Everyone, the offense, the defense, the special teams, and the last guy on the traveling squad, bought into and was behind the call an the play. That’s leadership. This will be a fun week leading up to what could be a tremendous Apple Cup. 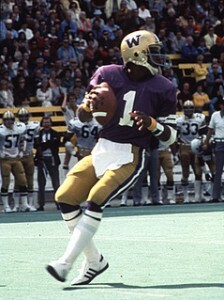 Don’t get me wrong; I’d be happy with Washington blowing the Cougars out early. I just don’t think that’s going to happen. I see a close game in hostile territory for all the marbles of post-season. Should be fun. P.S. How about that Husky defense led by Mason Foster. Nick Holt’s group has been widely criticized all year. However, when they have been most need in the past two games, they’ve only surrendered one touchdown and that was 7 quarters ago! They will need a similar effort next week.